We take a look at 5 of the best golf stand bags on the market today, each of them with something slightly different to offer. Choosing the right golf bag can be a chore. The variety that comes from multiple styles and uses means that one choice will lead to another more difficult one. For those wanting to replace the old tattered bag you first must choose the function you want your bag to accomplish. If you don’t see yourself walking 18 holes too often then the staff or cart style golf bag is where you want to begin your journey. Golfers who will sprinkle in some walking rounds and want versatility should look to the carry bag for their needs. A staff bag is a style most associated with the tour professional. Staff golf bags are the most expensive of the four types listed here. This is due to the size and lavishness of the bag. Staff bags are large by nature because the typical pro needs everything to come with him onto the course. Extra balls, towels, gloves, rain gear and an umbrella all have to be on hand if the situation on the course dictates its’ use. This style of bag doesn’t normally appeal to the once-a-month golfer however. A cart bag is a more reasonably priced version of the staff bag. Lighter and less bulky than the higher priced model, the cart bag is more for the weekend warrior who will use a cart for his 18 holes and wants the extra storage commonly associated with the staff bag. Those two bags are commonly tied to golfers who play courses that demand the use of caddies or carts. For those that want a bit more flexibility, then may we suggest the stand bag. The greatness of the stand bag is in its design. It’s incredibly light, utilizes its length for long pockets that can easily store the essentials for a day at the club and it has two retractable legs that is useful for the range or walking the course. 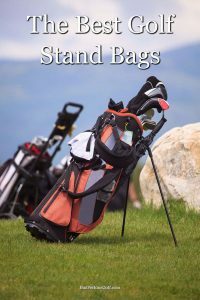 Stand bags feature two straps for your shoulders that make it easier to carry whether you are walking up the fairway or taking the clubs to the pro shop. Due to this flexibility the stand bag is an outstanding choice for those looking to update their bag. Callaway Fusion 14 is an extremely versatile entry into the carry bag field. The “14” in the name refers to 14 individual club dividers that keep each club free from rattling against the others in the bag. This easily reduces wear and tear over the life of the club. The Fusion has a mind-boggling 10 pockets to store any item your day on the links could demand. Included in this set of 10 is the always useful water-resistant, Velour lined pocket that stores fragile and important items like your cellphone and wallet. With an integrated holder that will carry an alignment stick, the Fusion also has a revamped Comfort Tech Strap System that offers a quicker release from the golfer’s shoulders. This is a bag that has a tremendous amount of function. Highly recommended. The 2017 version of the Sun Mountain 2Five continues the line’s tradition of being the lightest carry bag on the market. For the golfer looking for simplicity the 2Five is the bag for you. Although it doesn’t have the quantity of pockets or club dividers that the Callaway Fusion features, the Sun Mountain uses its high quality assembly to maximize function for the golfer. That doesn’t mean that the 2Five skimps on standard features like the valuables pouch or holders for your umbrella and towel. All of those necessities are there but Sun Mountain is far more interested in creating a bag that is strong and without the burden a heavier bag can place upon the walking golfer. If you are looking for a durable, lightweight bag then the Sun Mountain 2Five is a great choice. One of the best companies in the golf industry, Ogio, has really outdone themselves with this year’s version of the Cirrus stand bag. This model is similar to the Sun Mountain 2Five bag in that it has been designed specifically to be a sturdy yet weigh as little as possible. Their mission has been very successful as the Cirrus features seven club holding areas with one designated specifically for an individual club such as a putter or driver you would like to keep separated from the other clubs. Other features on the Cirrus include a valuables pocket, water bottle holster that is accessible when walking and an integrated handle that helps when lifting the bag onto a cart. Great mid-sized bag for those who want lightweight with several club dividers. Ping’s addition to the carry bag market is the Hoofer model. With a five-way reinforced top, the Hoofer’s best innovation is the addition of a cart-strap channel. This channel allows the bag to be strapped into a cart without interfering with the pockets for easy accessibility during your round. Another great feature of the Hoofer is an attached rain hood that keeps the clubs dry when you are caught in a surprise storm. Solid bag that offers perks that few carry bags on the market can replicate. Recommended for durability and price point. If you are looking for more luxury from your carry bag then the last model on our list, the Mizuno Pro Stand bag, is the one for you. With four lined, cushioned pockets to carry your clubs, the Mizuno Pro is a bit heavier than the other bags on this list. That added weight is put to good use as the Pro is solid as a rock and can take the beating of 18 holes with barely a scratch to show. For those looking for a bag that will last years and be gentle on your clubs, the Mizuno Pro is a terrific option. A quality bag will not only offer you all the storage and flexibility you need but will also be lighter on your back and shoulders, leaving you less tired and sore. Each of the bags featured here deservedly earn their place on any list of the best golf stand bags currently on the market, and any of them would be a good choice.